Unknown Mozart? Certainly it was to me, even though a few of the compositions are well-known � but not in these settings. Clarinettist Dieter Kl�cker, who contributes the lion�s share of the obbligato playing, explains in the liner notes that �it was by pure chance that I was fortunate enough ... to stumble on the arias ... presented here, while browsing through various collections � mainly in Eastern Europe � of arias in which the voice is partnered by an obbligato instrument - The quality of these rediscovered works was extraordinarily high, particularly in the case of the arias with clarinet, probably on account of the novelty of the sound of this, then, recently invented instrument.� Further on he also admits that the authenticity of some of the works is not fully confirmed � and probably never will be. Never mind, whether Mozart or not it is still attractive music, and there is always room for attractive music. All of these arias are settings of religious Latin texts, apart from the last of them which is in German and could possibly be called quasi-religious. The virtuosity required from both soprano and clarinettist hints that it was probably conceived for concert purposes, but there also exists a Latin text. Moreover all the other arias are to greater or lesser extent virtuoso pieces. In 1987 little or nothing seems to have been known about performances. That Mozart loved the clarinet is well-known and especially when played by his friend, the �Bohemian wonder� Anton Stadler. He wrote two of his most beautiful works for him, the clarinet quintet and the clarinet concerto. He also used an obbligato clarinet - in one case rather the basset horn - in two arias from La clemenza di Tito, and one of them, Parto, parto ma tu ben mio is heard here with the text Jesu dulcis memoria (track 5). Likewise the opening number Cor Sincerum, is an arrangement of the E flat major aria Non temer, amato bene (K. 505) composed originally to replace an aria from Idomeneo. Alfred Einstein states that the aria was a declaration of love to Nancy Storace, who is also the dedicatee. He had already written an aria to the same text half a year earlier (K. 490) for a private performance of the opera by Prince Karl Auersperg. There he used a solo violin as obbligato instrument; with the Latin text Domine Deus salutis meae, recorded here (track 7) he utilized the clarinet. Generally speaking the obbligato parts are challenges to even great virtuosos, but the three we have here execute their solos with the utmost elegance and confidence. 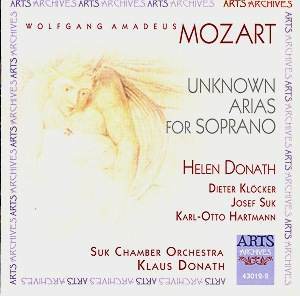 In Helen Donath we have a Mozart singer who encompasses even the heaviest demands the composer puts upon her. Texan by birth she came to Europe at a very early age and her break-through was as Pamina, a role she first sang at Hannover. I first came across her, still young, as a lovely Sophie in the now legendary Decca recording of Der Rosenkavalier under Georg Solti. That was issued in autumn 1969 and has ever since been my benchmark version. On the present disc she retains much of her youthful timbre and lightness and beauty of tone, even though she can�t hide that the years have passed. The tone has hardened slightly, the vibrato widened ever so little but her phrasing is so right and her technique, not least her coloratura singing, is admirable. The Suk Chamber Orchestra play well, as was expected, under the direction of the soprano�s husband. The sound, an original digital recording remastered 24 bit/96 KHz, is worthy of the occasion. Dieter Kl�cker�s notes are personal and perspective building. The sung texts are printed, although without translations. This may not be an indispensable disc but with such high-quality singing and playing it is well worth acquaintance � not perhaps for continuous listening very often but for dipping into one or two arias at a time. Don�t let the anaemic cover picture deter you; the singing is full-blooded!